Blog Economy 7 Heaters: Is the Cheaper Tariff Right for You? Economy 7 energy tariffs, or differential tariffs as they’re technically called, provide seven hours of discounted, cheaper electricity throughout the night. Originally designed as a way to use the residual electricity that comes from running power stations without stopping, Economy 7 energy tariffs can be the cheaper option. The question is, will it be cheaper for you? There are over 3.5 million of us using an Economy 7 meter and, paradoxically, around 38% of that 3.5 million don’t use Economy 7 heaters or even use the night-time rate. With miss-matching statistics like that, you have to wonder how effective Economy 7 really is and if people know how to use it properly in the first place. For honest, illuminating Economy 7 advice – look no further. We’ll briefly explore how Economy 7 works, what appliances you can and can’t use, and we’ll provide a checklist with some simple tips for making the most of your economy tariff. Very simply, Economy 7 is an energy tariff that hinges on two different energy rates. The cheaper night-time rate, and a substantially more expensive overflow rate for any electricity used in the day. 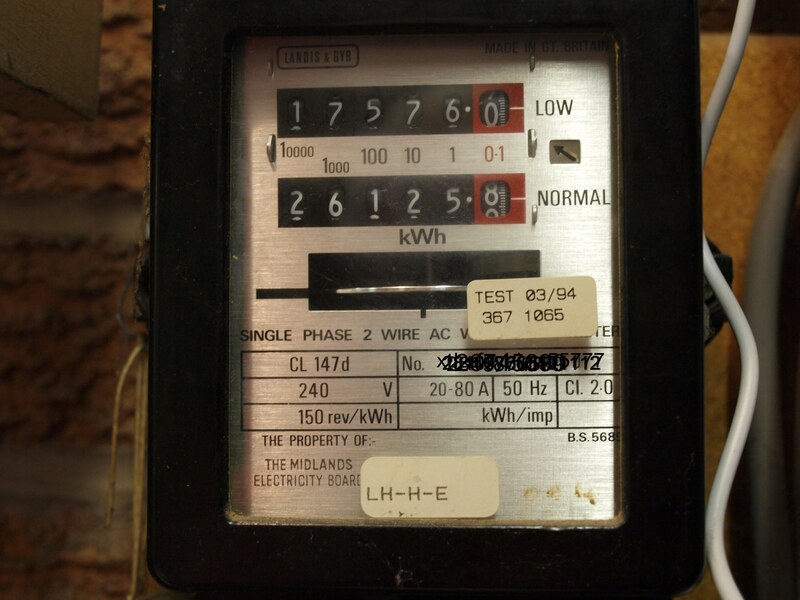 Just like a normal electricity meter, an Economy 7 meter counts the amount of power used to calculate how much you pay. Unlike a normal meter, an Economy 7 meter has two dials reflecting the two separate rates. Economy 7 discourages you from using too much electricity outside the off-peak rate because of the heavy charge. The table below, courtesy of the Money Saving Expert, shows you just how much the two rates differ. Economy 7 is all well and good if you’re using the discounted night-time rate, but you can imagine the extent of your bill if you continually dip into the daytime rate. Experts have calculated that you need to use 40% of your daily electricity at night to see any benefit from Economy 7. So, if you’re more of a night-owl than a songbird, it might be worth considering. If you think you’ll find yourself having to use daytime electricity just as frequently as night-time electricity, it might not be the best option. What can you use with Economy 7? To a certain extent, you can use whatever you like with Economy 7. Anything that runs on electricity will still physically work on an economy tariff – it’s simply a matter of cost. For the cheapest results, the bulk of your electricity will have to be used at night. Things like washing machines, tumble dryers, heating, hot water – all of these utilities are big spenders with regards to energy consumption. To keep the cost as low as it can be, and to avoid any hideously expensive daytime charges that undermine the initial saving, you’re going to have to plan your day-to-day chores and energy use. Binge watching Netflix on multiple devices while you wait for your family-sized meal to cook and your washing to come out of the dryer is a sure-fire way to land yourself with an alarming heating bill. Many Economy 7 households use immersion heaters to get hot water. Immersion heaters are tanks of water that warm up via a heating element – like a kettle on a larger scale. Many of these immersion heaters have two tanks, a primary supply that only gets hot when the night-time rate applies, and a secondary tank for emergencies throughout the day. As ever, the secondary tank will cost you and arm and a leg if you run out of reserves and need to spend daytime electricity heating water. Immersion heaters operate on the same principle as night storage heaters. They’re ‘charged’ up overnight and the water is kept warm throughout the day until it’s needed. If you run out of water, just like if you run out of heat from an Economy 7 heater, it’ll cost you to obtain more. With constrictions like that, Economy 7 really is a lifestyle change. Spontaneity is replaced by structure and you’ll need to be hyper-aware of your energy consumption. Bearing all of this in mind, let’s have a look at some pros and cons. If you’re still dead-set on the allure of cheaper energy, or perhaps you’ve been using Economy 7 for so long you don’t notice or mind the lifestyle change, these helpful tips will ensure you’re still getting the best out of your energy tariff. They don’t need to be expensive timers, many online retailers sell them for a few pounds, but having something that limits the operating hours of your appliances can save you money in the long run and ensure you’re not dipping into the expensive daytime rate. Set your washer or dryer to come on overnight and use the timer to ensure it finishes just before the daytime rate starts, avoiding any additional charge. With the EU EcoDesign Directive taking effect this week, finding energy-efficient appliances is about to get a whole lot easier. Choose the most energy-efficient appliances you can to ensure you’re using as little energy as possible. Night storage heaters were originally designed to run on Economy 7 tariffs and are the only real heating option short of rubbing two sticks together or layering up. For the best results, choose smart storage heaters that are fan-assisted for additional heat. Smart storage heaters also come with digital programming, so you can decide when your heaters turn on, further saving you money. Remember to set the ‘output’ value as low as you can throughout the day else you’ll be losing heat rapidly and you run the risk of running out of heat altogether. Each region and each energy company that offers an economy tariff has slightly different hours for the discounted rate. The exact times of the cheaper tariff are also subject to change, so keep an eye on your meter to see when the cheaper tariff starts. Ensuring you know the exact time period for your cheaper energy is crucial to avoid toe-curlingly expensive bills. 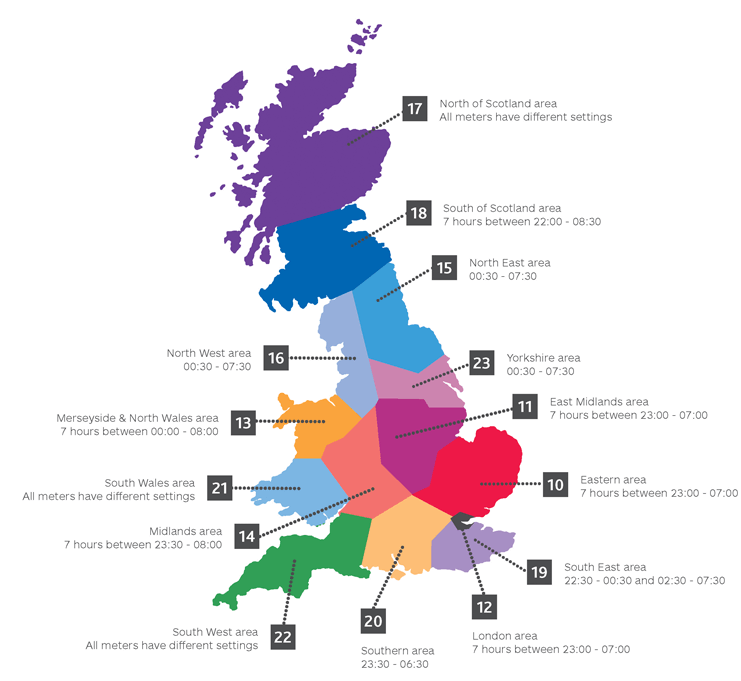 The map provided shows N Power’s Economy 7 times across the UK and similar maps can be found for other energy providers. If you’re unsure when your rates start and end, it won’t hurt to check with your energy provider. Keep your washing machines at 30°C, turn your thermostat down by a few degrees, and keep warm throughout the day by wearing your jumper rather than relying on your limited supply of heat. Economy 7 has never been everyone’s cup of tea. If following the advice above seems too much, chances are you’d better off on a standard energy tariff – most energy companies even swap you over free of charge! If you’re a large family, spend the majority of your time away from the house, or just don’t fancy such an inflexible daily routine, it’s time to ditch Economy 7 and look for some alternatives. Choosing an electric radiator is a great way to provide energy-efficient heating for your home that won’t cost you a fortune to run throughout the day. For those of you who love your Economy 7 tariff and wouldn’t have it any other way, we stock a selection of storage heaters just for you – from simple manual models to sophisticated smart storage heaters. Whatever your requirements, we have the ideal Economy 7 heater to suit your household.